A recap. Between 23rd July and 31st August 2008, the first exhibition of Andy Warhol’s record cover art was shown at Piteå Museum, Piteå, in the north of Sweden. The exhibition was entitled “Happy Birthday, Andy Warhol” as it coincided with what would have been Warhol’s 80th birthday on 6th August 2008. One month later, my friend Tomas Ersson, visited me and I told him about the exhibition and he mentioned that he had recently read an article in a magazine where a Swedish musician told a story about how Andy Warhol had designed the cover for a single by the band he had been in as a 15-year-old. Unfortunately, Tomas could not remember where he had read the article, but he promised to try to locate it. A few days later he mailed me the article and my hunt for the RATFAB single started. The article is in Swedish and, coincidentally was published on Andy Warhol’s birthday, 6th August 2008, in the Swedish magazine Café. The article is actually an interview with Tomas Alfredsson, a Swedish film producer. At the end of the interview he was asked whether it was true that Andy Warhol had designed the cover for a single by the band in which he had been the drummer. Here’s the text where he explains how Warhol came to design the cover. 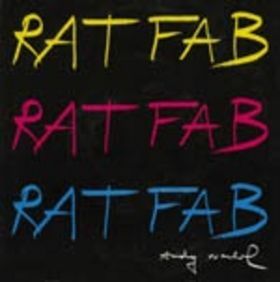 Andy Warhol’s design for the RATFAB single cover. TAW: “Till sist måste jag fråga om det är sant att Andy Warhol gjorde skivomslaget till ditt gamla rockbands enda singel. TA:– När jag var i 15-årsåldern var jag trummis i ett band som hette Ratfab, Roland And The Flying Albatros Band. Vår basist, Calle Häggqvist, hade en mycket originell farfar, Arne Häggqvist. Han bodde i en liten tvåa i Fruängen med sin stora konstsamling och anordnade litterära salonger i källaren. Arne var svensk­lärare, översättare, skribent och förläggare. Han introducerade Sartre på svenska, var ett socialt geni och lärde känna många intressanta, märkliga och berömda människor över hela världen. Han skrev Största cocktailboken, som mig veterligen fortfarande är den största cocktailboken. Arne var också konstexpert och skrev den första boken om hur man värderar konst. TAW: Och han var vän med Andy Warhol? TA: – Han hade träffat Hemingway och Salvador Dali och översatt Dalis böcker. Och så kände han Andy Warhol. Varje sommar sålde Arne en tavla ur sin konstsamling för att finansiera en resa åt honom och barnbarnet Calle. Den här sommaren skulle de åka till New York och träffa självaste Andy Warhol på The Factory. När vi i bandet fick höra det här sa vi till Calle: ”Du måste fråga om han inte kan göra vår logotype!” Och när Calle satt där med Warhol så frågade han faktiskt. Warhol sa: ”Det kan jag väl göra.” Han tog fram ett Andy Warhol-brevpapper och gjorde några olika förslag som han signerade. TAW: Hur såg de ut? TAW: Finally, I have to ask if it is true that Andy Warhol designed the cover to your old rock band’s only single? TA: When I was about 15 i was the drummer in a band calleed Ratfab, Roland and the Flying Albatros Band. Our bass player, Calle Häggqvist, had a very original grandfather, Arne Häggqvist. He lived in a little two-room flat in Fruängen with his huge art collection and organised litterary solons in the basement. Arne was a Swedish teacher, translator, writer and publisher. He introduced Sartre in Swedish, was a social genius and became acquainted with many interesting, remarkable, weird and famous people all over the world. He wrote “Största Cocktailboken2 (The Biggest Cocktail book), which is, as far as I know, still the biggest cocktail book. Arne was also an art expert and wrote the first book on how to evaluate art. TAW: And he was a friend of Andy Warhol? TA: – He had met Hemingway and Salvador Dali and translated Dali’s books. And he knew Andy Warhol. Every summer Arne sold a painting from his art collection to finance a trip for himslef and his grandson Calle. That summer they were going to New York and would meet Andy Warhol himself at The Factory. When the band got to hear of this we told Calle: “You must ask if he can make us a logo!” And when Calle satt there with Warhol, he actually asked him. “Sure I can.” He produced an Andy Warhol letterpaper and made a few suggestions that he signed. TAW: What did they look like? So, that’s the whole story. Thanks again Tomas Ersson for coming up with the goods! Previous PostA longstanding project – two impossible Warhol coversNext PostAn addition to my Peter Blake collection. Interesting post Richard, and a great job by your friend to locate the article once again. And the article was a good read also. Keep posting!